Library image #1884: A view of The Inkpot, one of the sinkhole lakes found in the Salt Creek Wilderness. The United States Congress designated the Salt Creek Wilderness (map) in 1970 and it now has a total of 9,621 acres. All of this wilderness is located in New Mexico and is managed by the Fish and Wildlife Service. Migratory waterfowl may consider this a sufficient winter home, but birders will see it as paradise. From October through February, the seasonal wetlands in and surrounding Salt Creek Wilderness play host to 5,000 to 20,000 ducks, 10,000 to 30,000 geese, as many as 30,000 cranes, and countless white pelicans and snowy egrets. The uplands, by contrast, are chock-full of quail, roadrunners, pheasant, desert cottontail rabbits, and black-tailed jackrabbits. More secretive but still to be found are mule deer, coyotes, bobcats, and badgers. Salt Creek Wilderness lies within the Bitter Lake National Wildlife Refuge which is made up of three Tracts. Most of the North Tract is designated Wilderness. 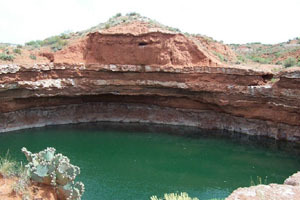 Salt Creek itself runs through the center of the Wilderness, an area of native grassland, sand dunes, brushy bottomlands, and a northern boundary distinguished by its red-rimmed plateau, all just west of the Pecos River. Planning to Visit the Salt Creek Wilderness? How to follow the seven standard Leave No Trace principles differs in different parts of the country (desert vs. Rocky Mountains). Click on any of the principles listed below to learn more about how they apply in the Salt Creek Wilderness.